Welcome to Homes and Villas Abroad, your surest route to buying property in Italy. We have nearly 10,000 houses for sale in Italy, advertised by hundreds of Italian real estate agents and private sellers. That includes typically Italian villas for sale in Tuscany, beach apartments in Calabria, countryside properties to restore in Umbria, farm house fixer-uppers with land for sale in Abruzzo, townhouses in Molise — the choice is endless, whatever part of Italy you are interested in. You can search through our selection of Italian houses and other real estate by using the “Click to start search” button in the top left hand corner of this page. 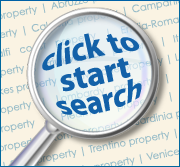 Or simply drop us an email telling us what kind of property in Italy you’re looking for — and we’ll find it for you. We offer complete start-to-finish assistance with buying Italy real estate: as well as find you something that’s just perfect for you, one of our bi-lingual specialists will accompany you to view any properties you are interested in; we handle negotiations and the legalities of the buying process; and we find you trusted professionals such as mortgage brokers, notaries and surveyors. Our expert team of Italian property specialists speaks a variety of languages, including English, Italian, Russian, German, Spanish, and French — all part of our commitment to providing our clients with the utmost in personal customer service. And as our team knows Italy from top to bottom, they are just the people to advise you on everything from the best places in Italy to buy a home, depending on your particular requirements and tastes, to assistance with obtaining a mortgage. What does all this cost you? Not a penny extra! Thanks to our professional relationships with a large network of real estate agents with years of experience in dealing with homes for sale in Italy, when Homes and Villas Abroad helps you to buy an Italian property, you pay no more than if you went directly to a real estate agent anywhere in Italy. So that means the vast array of additional services we offer — such as opening an Italian bank account for you, setting up your obligatory fiscal code, handling all the paperwork, taking you to property viewings and accompanying you to the notary’s office for the final deeds exchange — are all effectively FREE. Nearly 50 million tourists a year visit Italy, drawn by everything from its architectural gems, culture and landscapes to the chic boutiques of Milan and Amalfi — and the chance to shop around for real estate in Italy. Houses and other properties here remain a sound investment with significant rental potential if you buy in the right places. Furthermore, in Italy house prices remain relatively cheap compared to vast swathes of the UK and US. For instance, €25,000 can still buy you a habitable holiday home in several parts of southern Italy and even in parts of northern regions such as Piedmont. The market is now picking up, with the number of transactions for residential homes for sale in Italy 20.6 per cent higher in the first three months of 2016-17 compared to the same period 12 months previously. Total sales volumes, including office, retail and industrial, rose 17.3 per cent in that period. The rise in the retail sector of the property in Italy market has helped by a string of tax-lowering measures introduced by the Government. In addition, Italy’s strict building regulations have protected it from the mass overdevelopment that has seen large parts of the Spanish coastal areas blighted by unsightly tower blocks. Its similarly strict purchasing process, which can seem labyrinthine to the uninitiated, also offers protection to the buyer by making practices such as gazumping impossible. In truth the world’s love affair with all things Italian stretches back centuries. Italy boasts a rich cultural history that no other country on earth can match as evinced by its timeless landmarks. The Colosseum and Pantheon in Rome, Florence’s Duomo and Uffizi Gallery, the canals of Venice, the Leaning Tower of Pisa, the ruins of Pompeii…the list is endless. King Alfred the Great’s love of learning is said to have been inspired by a ninth-century visit to Rome. In the 18th century, the Grand Tour became an unmissable rite of passage for young English gentlemen. Fast forward a century and a slew of bright young poets trod the same path but went one better by settling down in Italy. The poets Robert and Elizabeth Browning were long-term residents of Florence. John Keats spent four years in Italy, dying in Rome in 1821. Percy Bysshe Shelley (whose wife Mary wrote the Gothic masterpiece Frankenstein) drowned in 1822 while sailing off Lerici in Liguria, at a spot since renamed Il Golfo dei Poeti (The Bay of Poets). And enfant terrible Lord Byron spent more than six years in Italy, during which time he wrote some of his most famous work, including Don Juan. Others to have fallen under Italy’s spell include everyone from the painter JMW Turner to the writers John Steinbeck and James Joyce. There are no restrictions on foreigners purchasing a home in Italy. In any case, if you buy your property through Homes and Villas Abroad, we will handle the purchase process for you from start to finish. But it never hurts to know what it entails. Once you have decided on a property in Italy, you table a formal offer — called a proposta irrevocabile di acquisto (irrevocable proposal to buy) — and put down a deposit so that the seller takes it off the market. The size of the deposit can be negotiated but is usually around five per cent of the sale price. If the property is part of a block, all condominium fees are disclosed. As previously mentioned, Homes and Villas Abroad will carry out these checks for you. For added reassurance, you may also wish to take out our legal service, details of which are available on request. We recommend as well that you hire a surveyor to perform detailed checks on the physical state of the property. Note that the surveyor will bill you separately. You will also need obtain a fiscal code (codice fiscale) from the tax authorities as plus open an Italian bank account. Again, these are services that, if you are buying your property in Italy through Homes and Villas Abroad, we will carry out for you at no extra charge. The next stage is for both buyer and seller to sign a preliminary sales contract (contratto preliminare di compravendita, or compromesso). In this document, both sides agree a timescale for completion of the purchase, typically around six weeks. The buyer also puts down a second deposit, bringing his total paid so far to around ten to 30 per cent of the sale price. Note that should you as the buyer withdraw from the deal after the compromesso is signed, you stand to lose your entire deposit. Should the seller renege, they must repay your entire deposit or, in certain types of compromesso, twice your entire deposit. Needless to say, this is not a commitment to be taken lightly. The final step sees the completion of the purchase with the signing of the rogito (final deeds). The notary is a neutral public official whose role it is to perform formal confirmation of the identities of buyer and seller as well as a final check on all documentation. If the buyer is not fluent in Italian, the notary will insist that they appoint an Italian-speaking representative to act as power of attorney at the signing of the final deeds. A Homes and Villas Abroad representative will usually fulfil this role at no extra cost. The notary will hand you a copy of the deeds and will forward other copies to the Land Registry and tax authorities. Within 48 hours of the final deeds being signed, the seller has to inform the local police station of the change of ownership (done via a denuncia di cessione fabbricato document). There will usually be some scope for negotiation on listed prices. As a rule of thumb (as opposed to a hard and fast rule) this will typically be in the region of 8 to 12 per cent, but may be significantly less at the luxury end of the market or if a property has already been reduced in price. Registry tax of 2 per cent of cadastral value if you are a foreigner who has registered for Italian residency and are buying an Italian home for the first time. The tax is charged at 9 per cent of cadastral value for all other foreigners. Buyers typically have up to 18 months after purchase to register for Italian residency should they wish to do so — again a service Homes and Villas Abroad offers at no additional charge. Cadastral value is a notional valuation placed on the property by the Land Registry, taking into account rentable value, location and size, and is generally significantly less than the property’s market value. Land Registry tax of €100. However, none of the three items above apply if you are buying your home in Italy directly from a company. In this case, if it will be your principal residence, 4 per cent VAT is payable. If not intended as your principal residence, the VAT is ten per cent. Surveyor: Varies, but expect €500+. Agent’s fee: Typically 3% of purchase price for properties over €100,000. For properties below this value, a flat fee is usually charged. As already mentioned, Homes and Villas Abroad does not charge anything on top of the standard agent’s fee payable whether you buy your property in Italy through us or not. After purchase, there are three municipal taxes, IMU, TARI and TASI. These vary depending on property and location, but will typically be under about €800 a year.